So Boston is a boomtown. 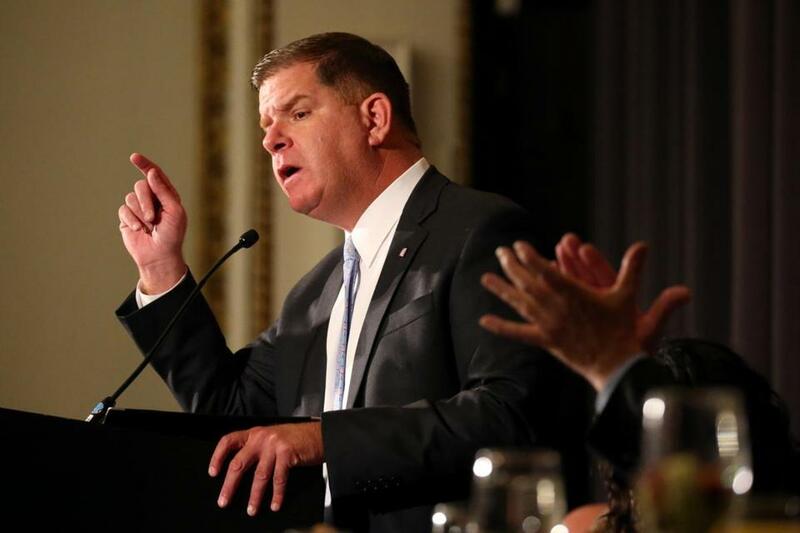 How much credit can Marty Walsh take? Mayor Martin J. Walsh has said that since taking office in 2014, his administration added 60,000 jobs in Boston. But how much credit can Walsh take for the city’s economic boom? Mayor Martin J. Walsh, in speeches and campaign literature, has said that since taking office in 2014, his administration added 60,000 jobs in Boston — a dynamic feat for any elected official. But how much credit can Walsh take for the city’s economic boom? While he has undoubtedly played a role, several economists and public policy experts say many of the policies that paved the way for the city’s strong economy began before he took office. Boston, like other major US cities, experienced steady growth following the Great Recession, when Mayor Thomas M. Menino was still in office, with low unemployment, a surge of high-profile companies, and a real estate market in the midst of a historic building boom. Moody’s — the credit rating company — has been giving Boston its highest rating, “AAA,” since 2011, according to its website. John Barros, the mayor’s economic development chief, in an interview said the government has been “a huge player” in companies’ decisions to move their operations and headquarters to Boston, including luring a new General Electric headquarters. He said the city has established a positive “tax environment,” improved its relationship with the state, and eased the permitting process for businesses. The city has also made a major $1 billion investment pledge to repairing its school system’s facilities, he said. None of this would have been possible without government intervention, Barros insisted. But Alan Clayton-Matthews, an associate professor of economics and public policy at Northeastern University, said that although Walsh had a role to play in the city’s good economy, including the GE deal, the industrial giant might have come to the technology-friendly city anyway. In a speech to business leaders last year, GE’s former chief executive, Jeffrey Immelt, said the industrial giant chose Boston because it has a critical role to play in the next wave of technology innovation, which will use data and analytics to connect machines for big businesses. Political scientists say mayors can have some short-term effect on their local economies, such as wooing firms to their cities and projecting leadership, strength, and stability. Tax credits and breaks for development also help. But a mayor’s effect on private sector job growth is usually long term. It’s more often reflected in a strong school system in which a high number of students go on to college and, later, well-paying jobs, said Michael Goodman, executive director of the Public Policy Center at the University of Massachusetts Dartmouth. Mayors, he added, can work to ensure that communities are safe and that once-struggling neighborhoods have transformed to communities that attract new families. According to the Walsh administration, crime overall is at a two-decade low, quality of life is improving, and unemployment (around 3 percent) has declined. High school graduation rates (at 72 percent) have climbed since 2013. However, the Globe reported last month that more than two dozen schools in Boston with low standardized test scores are at risk of being declared underperforming by the state, putting them in danger of losing teachers and principals. The city’s good economic fortune has come up in Walsh’s reelection bid, and his challenger, Councilor Tito Jackson, makes the case that many across the city have not benefited from the development boom. He also said that Boston businesses owned by women and people of color have largely been denied access to city contracts. “Job growth has not occurred equally across the city,’’ Jackson said in an interview. “If he is going to take credit for the job growth, then he must also take responsibility’’ for people still struggling. Barros, the economic development chief, said that under Walsh, Boston has become an economic leader, outpacing the United States and leading cities at a time when big metropolitan areas are at the front of the country’s economic resurgence. But some economists describe Barros’s assertions as “hyperbolic.” They agreed that Boston’s economy has performed well on most conventional indicators since 2009 and that the city is among the nation’s strongest economies. But they said they doubted whether the Hub is leading other big, metropolitan technology cities such as San Francisco, Seattle, or New York. Indeed, in the competition for Amazon’s second headquarters — a prize that brings with it an estimated 50,000 jobs — experts rank Boston among other top-tier and second-tier metropolitan contenders with tech talent. “Having said that — to claim that he alone is responsible for 60,000 jobs, of course that’s stretching it a little bit,” said Bluestone, who is also a senior fellow at The Boston Foundation. But on the campaign trail, Walsh has extolled that 60,000 jobs number frequently. That figure — which Barros said is conservative at best — is gleaned from state and federal data that also show just over 783,000 total jobs in the city. He repeated the figure in other public comments, explaining that his administration worked to bring high-tech companies to the city. The mayor also pointed out — and political scientists agree — that if jobs were fleeing the city, his administration would be blamed. Touting good job numbers is “what mayors do” and is part of a long political history of campaigning, said Shomon Shamsuddin, assistant professor of social policy at Tufts University. “Even if we grant that certain mayors are correct in saying that they themselves or their actions created new jobs, not all the jobs are created equally,” he said. Shamsuddin said there has been a “hollowing out” or disappearance of middle-skilled jobs nationally. High-paying jobs are increasing, but not so much for low-skilled jobs, he added. Most of Boston’s new jobs were in health care and social assistance and professional, scientific, and technical services, according to city data. But the jobs the mayor is espousing have not trickled down some areas of the city that have not seen their economic fortunes bloom, some experts say. John Drew, president of the antipoverty group Action for Boston Community Development, said low-income people still flock to his nonprofit to seek assistance — to pay rent, get work, and feed their families.